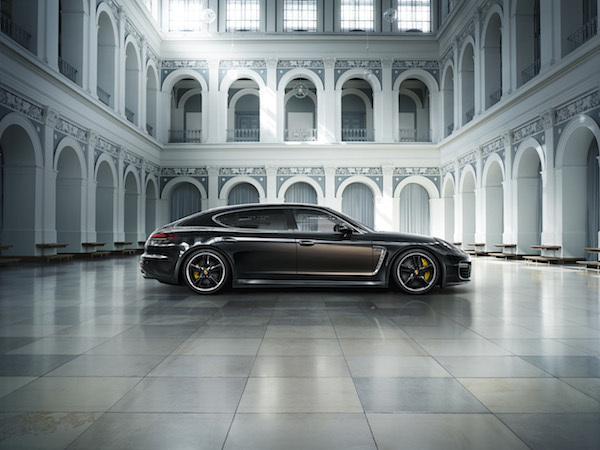 Earlier today Porsche revealed the Panamera Exclusive Series in the form of the Turbo S Executive you see above. Limited to just 100 units worldwide this Teutonic limo's world premier will take place at the 2014 LA Auto show and can be yours for $263,900. This may be the first Porsche ever where we would prefer the back seat to the driver's seat. Outfitted with the newly developed "Rear Seat Entertainment System Plus" those being chauffeured have two 10.1-inch high resolution touchscreens to choose from. Each are equipped with a built-in camera and integrated DVD player and mobile internet access. Sound can be played via wireless headphones or the Burmester® high-end surround sound system. While this Porsche might be built for hauling passengers in style, the rest of the interior is pretty posh, too. Hand picked, chestnut brown leather covers the seats and lower door panels. While the upper panels are dressed in Black Milled Napa leather. On hot days, your seat is cooled via perforations cut in the shape of the Porsche crest. The outside is completed in another first for Porsche, a two-tone paint scheme that combines Jet Black metallic with a contrasting Chestnut Brown metallic along the side of the limo Porsche from front to rear starting behind the front air outlet. If the two-tone paint isn't your thing, Porsche will offer more traditional colors for those who desire it. Think all this luxury and size will sacrifice performance? Hardly. Even with the curb weight of your average Cayenne (4,586 lbs), the Panamera Exclusive pushes 570 hp, hitting a top speed of 192 MPH. We're pretty sure you'll get to your destination on time and in style. Check out Porsche's micro-site for full technical specs. Last, but not least, for those who must have it all, Porsche is offering a custom-tailored luggage set with two trolleys, two weekender bags and a beauty case – also made of Poltrona Frau® leather in Chestnut Brown and featuring crest-shaped perforations as an available option. No word yet on pricing, but expect it to be slightly less than the luggage for the 918 Spyder.